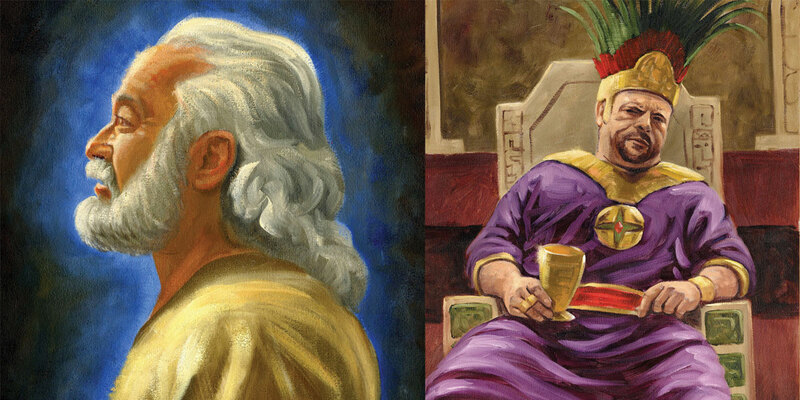 How Does The Book of Mormon Use a Hebrew Pun on King Noah's Name? The Book of Mormon reminds us that, ultimately, Christ is the one who comforts us and gives us rest. Bowen put it well, “The Lord’s promise regarding the earth’s eventual rest that would come because of and through Noah’s posterity—specifically Jesus Christ, ... should still ‘comfort’ all of us.”21 The Book of Mormon confirms the reality of Christ’s words, “Come unto me, all ye that labour and are heavy laden, and I will give you rest” (Matthew 11:28). As the people of King Noah learned though sad experience, rest and comfort are sometimes hard to find.22 However, if we remember that real rest comes from Christ, not from worldly sources or institutions, we can experience the comfort and peace that only He can bring. Matthew Bowen, “‘This Son Shall Comfort Us’: An Onomastic Tale of Two Noahs,” Interpreter: A Journal of Mormon Scripture 23 (2017): 263‒298. Matthew L. Bowen, “‘And He Was a Young Man’: The Literary Preservation of Alma’s Autobiographical Wordplay,” Insights 30 (2010): 2‒3. Taylor Halverson, “The Surprising Meanings Behind ‘Enos’ and ‘Noah’: Insights into Book of Mormon Names,” LDS Living, October 14, 2017, online at ldsliving.com. Jeffrey M. Bradshaw, “Was Noah’s Ark Designed As a Floating Temple?,” KnoWhy OTL06A (January 29, 2018). 1. Matthew L. Bowen, “‘This Son Shall Comfort Us’: An Onomastic Tale of Two Noahs,” Interpreter: A Journal of Mormon Scripture 23 (2017): 263. 2. Bowen, “‘This Son Shall Comfort Us’,” 263. 4. Bowen, “‘This Son Shall Comfort Us’,” 264. 8. For an extensive treatment of this topic, see Bowen, “‘This Son Shall Comfort Us’,” 265–279. See also Terrence L. Szink, “The Vision of Enoch: Structure of a Masterpiece,” Journal of the Book of Mormon and Other Restoration Scripture 17, no. 1–2 (2008): 13‒14, 18. 9. Bowen, “‘This Son Shall Comfort Us’,” 279. 10. Bowen, “‘This Son Shall Comfort Us’,” 279. 11. Bowen, “‘This Son Shall Comfort Us’,” 279–280. 12. Bowen, “‘This Son Shall Comfort Us’,” 280. 13. See Bowen, “‘This Son Shall Comfort Us’,” 280. 14. See Bowen, “‘This Son Shall Comfort Us’,” 280–281. 15. Bowen, “‘This Son Shall Comfort Us’,” 281–282. 17. See Bowen, “‘This Son Shall Comfort Us’,” 282. 18. For an explanation of how King Noah’s people may have understood this verse, see Book of Mormon Central, “Why Would Noah's Priests Quiz Abinadi on Isaiah? (Mosiah 12:20–21),” KnoWhy 89 (April 29, 2016). 19. See Bowen, “‘This Son Shall Comfort Us’,” 287–288. 20. Bowen, “‘This Son Shall Comfort Us’,” 287–288. 21. Bowen, “‘This Son Shall Comfort Us’,” 296. 22. For an analysis of how King Noah failed in this area, see Lee L. Donaldson, “Benjamin and Noah: The Principle of Dominion,” in Mosiah, Salvation Only through Christ, ed. Monte S. Nyman and Charles D. Tate Jr., The Book of Mormon Symposium Series, Volume 5 (Provo, UT: Religious Studies Center, Brigham Young University, 1991), 49–58.